How Is the Charpai Made? How Is the Charpai Used? 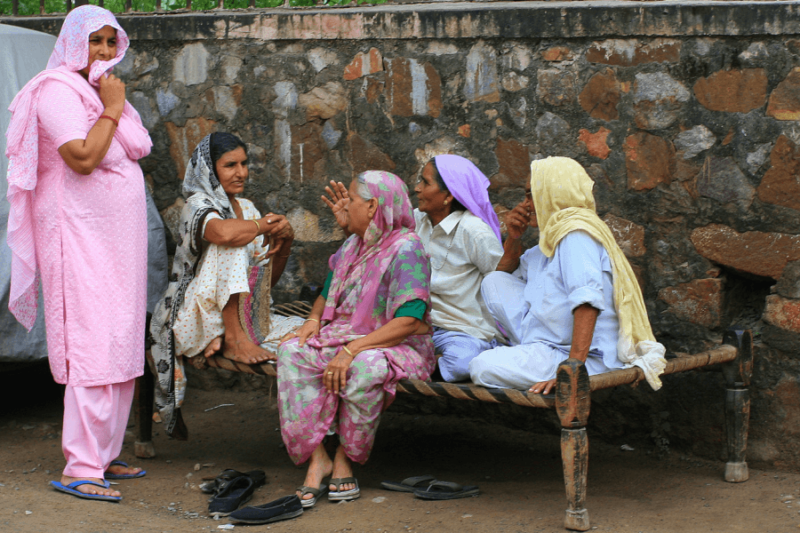 Charpai Alternatives: What Can Be Used Instead? The charpai has a curious significance to the Indian subcontinent’s cultural memory. Some consider it a symbol of a enduring rural poverty. Some may simply see it as a nostalgic item. Nevertheless, the charpai has survived and thrived as more than a novelty for centuries upon centuries. The charpai (Hindi: चारपाई; Urdu: چارپائی) is a traditional handwoven bed from the Indian subcontinent. It goes by many names, and the most common are variations of a term that literally means “four-footed”: charpai, charpoy, and charpaya. The charpai can also be referred to as khatiya, khatlo, khatt, or manji. What Is the History of the Charpai? Widespread use of the charpai in Bangladesh, India, Pakistan and neighboring countries is easy to understand. After all, this is its ancient point of origin. But how did the charpai become known globally? The British Empire and its colonization of India had a lot to do with this. While India’s products bolstered trading, it was India’s manpower that was truly significant. The British supplemented their armed forces with regimented soldiers from India. Why is this important? These soldiers from India took the charpai with them to other British colonies and territories. In particular, recruited Sikhs sent to Malaysia during the Victorian era were known to use and carry around their charpai. Of course, the British themselves brought the idea of the charpai back to Europe. 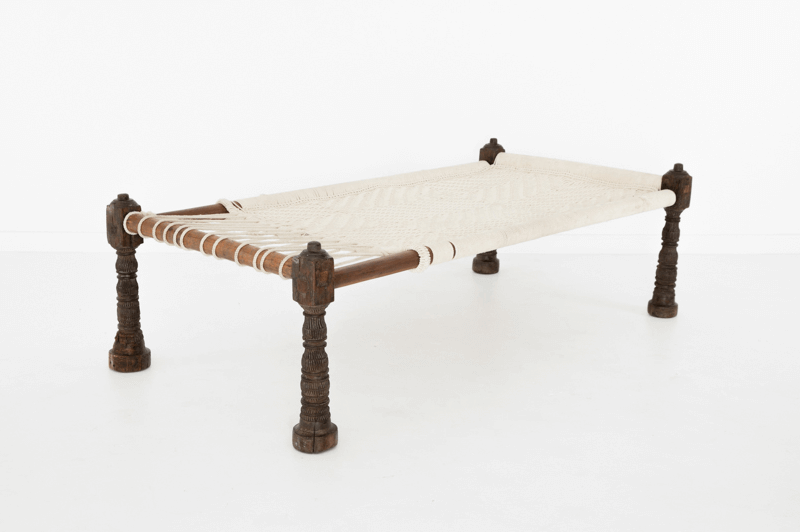 Many British colonial daybed designs—vintage or otherwise—feature charpai-like elements. What Does the Charpai Look Like? The foundation of a traditional charpai is a four-footed frame, which supports a handwoven net made of rope or belts of fabric. Due to the prevalence of rope variants, the charpai is also sometimes called a rope bed. It is impossible to talk about the charpai without mentioning Abu Abdallah Muhammad Ibn Battuta. The account of this Medieval Moroccan scholar’s journeys provides us with one of the first written descriptions of the charpai. Ibn Battuta described beds in India as having four legs connected by four staves, and a plaited surface in between. Let’s expand on this below. The frame is usually made of lightweight wood, such as mango. The rope or fabric is typically made of natural materials, as well: cotton, jute, coir (coconut fiber) and even dried leaves, such as those from date palms. Modern technology has made its mark on the charpai. These days a charpai can be made with synthetic and non-traditional materials. Metal frames and nylon weaving material are not uncommon. The charpai is the product of two different types of expertise: weaving and carpentry. Charpai-making from scratch is rarely a one-man endeavor, but assembly can be. The traditional materials are commercially available, after all. Charpai makers in the Indian subcontinent continue to provide their services to locals. Should you be in the area, you may have a charpai made to your specifications! These specialists can buy all the materials, come to your home, and make the charpai there while you wait. 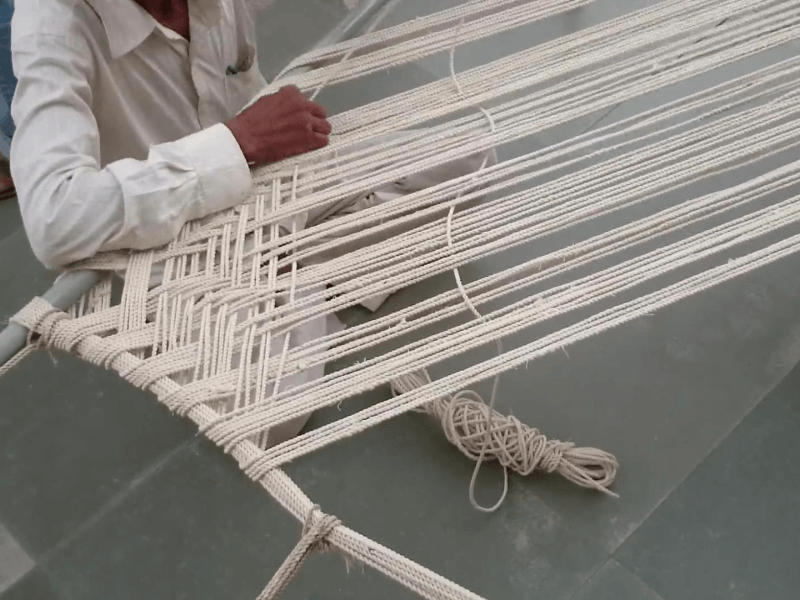 Frames are easy to set up, but weaving the charpai’s sleeping surface—depending on the complexity of the design—can take anywhere from minutes to hours. Some designs look like fishing nets, while some are woven so tightly together that it may as well be a solid mat. The resulting netting will be able to provide enough support for sleeping or sitting. Outside of the Indian subcontinent, the options are limited. You can either buy a pre-assembled charpai or attempt to make one yourself. People often sleep on the charpai as is—no mattress, and often not even a blanket or pillow. The point is to maximize ventilation and prevent heat and humidity from interrupting sleep. It is very common to see charpai outdoors in rural areas—even during the day. 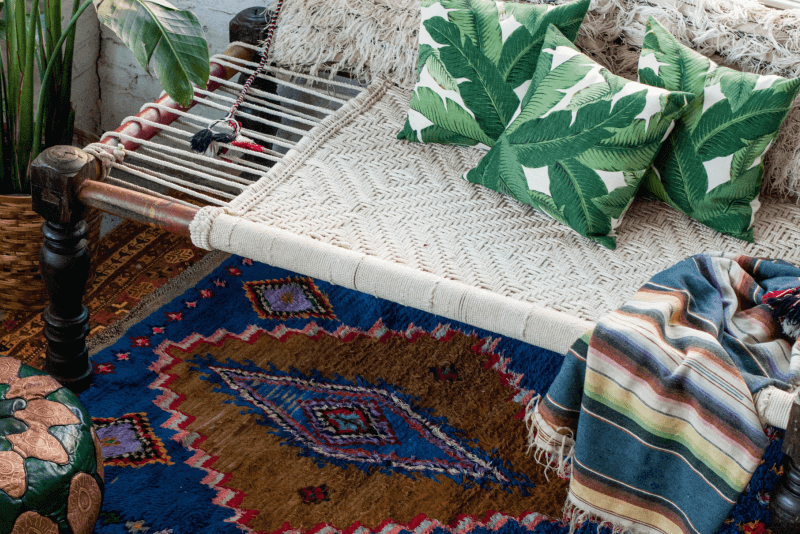 The charpai also makes a great daybed for napping, resting and socializing. Bigger charpai capable of seating three or more people can be found in public spaces. Think of them as huge park benches. They serve as meeting places for communal recreation. Smaller charpai function not as beds but as lounge chairs, stools, side tables or coffee tables. These variants are popular in urban areas and places outside the Indian subcontinent. When not in use, a traditional wooden and rope charpai may be moved to an unoccupied space of a dwelling. It can also simply be leaned against a wall. How Is the Charpai Different from Other Handwoven Beds? The charpai is particularly useful in warm and humid climates. The age-old design allows for good air flow and portability. These are advantages also seen in the tatami mat of Japan, the baníg of the Philippines, and the petate of Latin America. The main difference between the charpai and other handwoven traditional sleeping surfaces is the bed frame. This adds to the cooling effect due to more ventilation underneath. Another advantage of having a frame is the longer lifespan of the bed. Other handwoven sleeping mats can be rendered useless when the sleeping surface is compromised. Not the charpai! If the netting starts to sag or loosen, it is not difficult to repair. You can tighten the rope or fiber, or even replace the netting with new material altogether, while keeping the same frame intact. In fact, some Indian households have old charpai frames passed down from generation to generation. The frame also makes the charpai slightly less portable and space-saving, but not by much. As mentioned above, the Indian bed is meant to be lightweight and easy to move. Additionally, there are contemporary charpai with metal frames that can be folded up and tucked away when not in use. We are hesitant to recommend the traditional wood and rope charpai as a bed and mattress replacement. Why? Charpai maintenance is not easy for someone without experience. Unless you live in or around India, you’ll be hard pressed to find specialists to do it for you. However, definitely consider a charpai for a room centerpiece, daybed or outdoor bench. Interested in the benefits of the charpai as a bed and looking for more accessible and easier to maintain alternatives? Check out our suggestions below. Have a hankering for that on-vacation feeling? 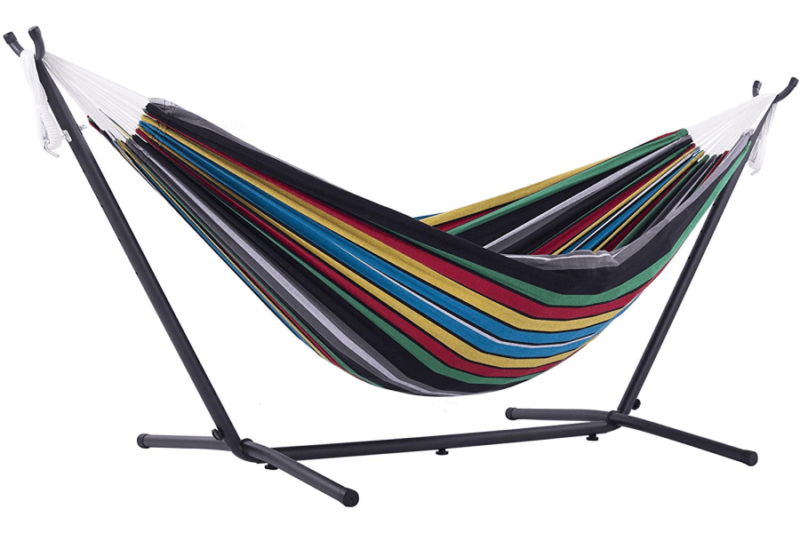 Hammocks are a relatively low cost alternative to going on a trip to some exotic locale. Like the charpai, they allow for maximum airflow and cooling. They’re also perfect for outdoor catnaps and lazy afternoons. If portability and cooling is what you’re after, these are your best bet. Finicky about sleeping on the floor? 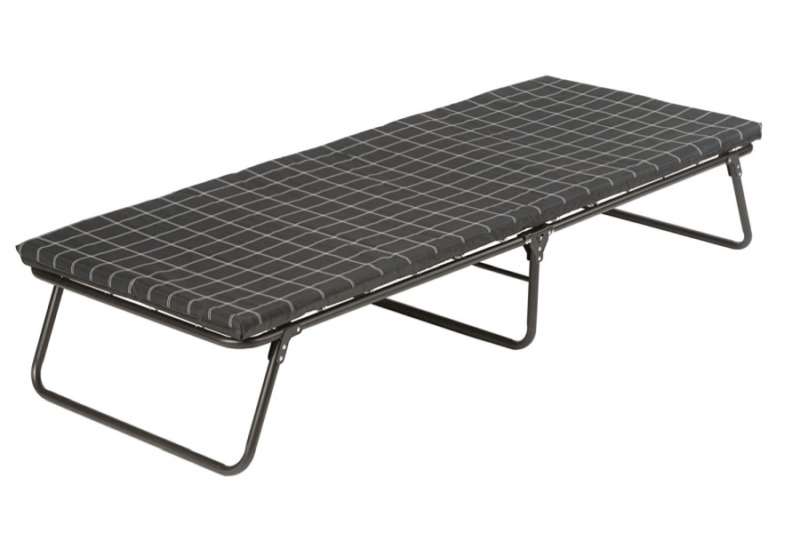 Unlike Japanese futons and sleeping bags, folding cots or beds have frames to keep the sleeping surface off the ground. The best part is that when you’re not using them, they don’t even take up that much space in storage.